Take three iron nails and clean them by rubbing with sand paper. Take two test tubes marked as (A) and (B). In each test tube, take about 10 mL copper sulphate solution. 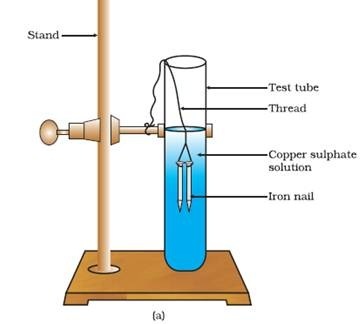 Tie two iron nails with a thread and immerse them carefully in the copper sulphate solution in test tube B for about 20 minutes [Fig. 1.8 (a)]. Keep one iron nail aside for comparison. After 20 minutes, take out the iron nails from the copper sulphate solution. Compare the intensity of the blue colour of copper sulphate solutions in test tubes and (B), [Fig. 1.8 (b)]. Also, compare the colour of the iron nails dipped in the copper sulphate solution with the one kept aside [Fig. 1.8 (b)]. Why does the iron nail become brownish in colour and the blue colour of copper sulphate solution fade? In this reaction, iron has displaced or removed another element, copper, from copper sulphate solution. This reaction is known as displacement reaction. Zinc and lead are more reactive elements than copper. They displace copper from its compounds.